This years Carnival Princess is nine year old Isabelle Wieland. Isabelle will lead the procession at the Ashington Festival on the 19th of August supported by her 2 attendants and 2 pageboys. The Carnival Princess’s two Attendants are Paige Read (9) and Phoebe Bush (5). The Pageboys are Peter Read (10) and Isaac Wieland (5). The children were all chosen by a lucky draw and attend Ashington C of E School. Ashington Carnival Princess was chosen at the annual Children’s Disco at Ashington Community Centre on Sunday 24th of April. There was great atmosphere at the disco with all the children joining in with the dance competitions and dancing around the hall full of excitement for the lucky draw raffle. This years Carnival Princess is twelve year old Amber Loisy who was crowned by 2015 Princess Lilia Simpson. Amber will lead the procession at the Ashington Festival on the 20th of August supported by her 2 attendants and 2 pageboys. The Carnival Princess’ two Attendants are Isabelle Fraser and Lois Comer (both age 5). The Pageboys are Todd Geal (5) and Oliver Fraser (8). The children were all chosen by a lucky draw. Ashington Carnival Princess was chosen at the annual Children’s Disco at Ashington Community Centre on Sunday 8th of March. The atmosphere at the disco was terrific due to the large turnout of children who enjoyed dances and competitions, even the parents joined in! This years Carnival Princess is nine year old Lilia Simpson who was crowned by 2014 Princess Daisy Richardson. 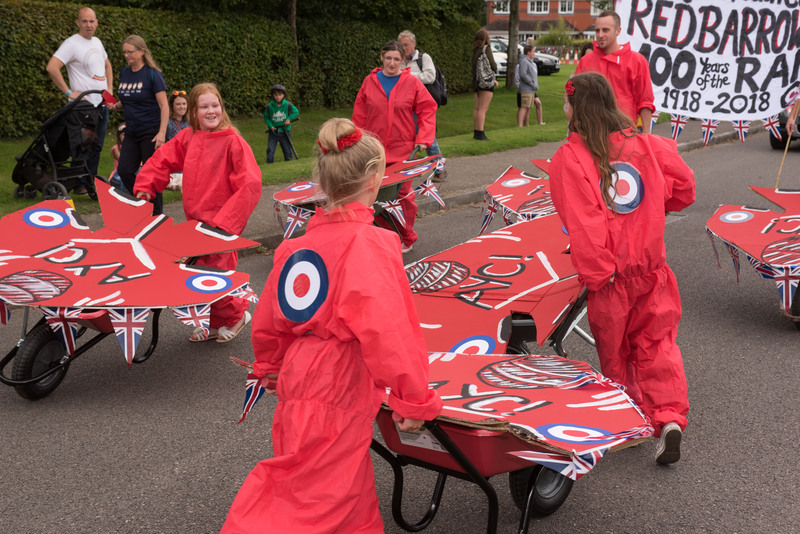 Lilia will lead the procession at the Ashington Festival on the 15th of August supported by 2 attendants and 2 pageboys. The Carnival Princess’ two Attendants are Daisy Wait and Evie Scovell (both age 5). The Pageboys are Matthew Roberts (5) and Luke English (6). The children were all chosen by lucky draw. Nine year old Daisy Richardson has been crowned as the 2014 Ashington Carnival Princess. The Ashington First School pupil was chosen this weekend, by lucky draw, at a Children’s Disco in Ashington Community Centre. 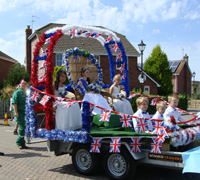 Daisy will lead the procession at the Ashington Festival on the 16th of August supported by 2 attendants and 3 pageboys. The Carnival Princess’ two Attendants are Isabella Aegisdottir and Lyndsey Lee (both age 5). The Pageboys are Alfie Price (6), Jacob Lee (8) and Julian Seymour (9). After a fabulous party, full of fun and games, this year’s Ashington Festival Princess was chosen by raffle. The party started at 1.30pm at the Ashington Community Centre and was well attended by children and adults alike. Entertainment was provided by the girls from Just 4 Kids Disco and included firm favourites including modern pop songs and old classics like “The Okey Cokey”. We even managed to persuade some of the parents onto the dance floor to join in! 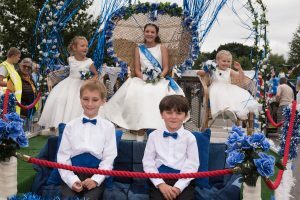 Matilda Richardson, aged 5, will take the Princess Throne on the lead float attended by Amber Teanby and Demi-Leigh Brown, both aged 6. Her Page Boys will be Alfie Neller, Douglas Murray and Lewis Nicholls, aged 5, 7 and 5½ respectively. All children attend the Ashington Church Of England School here in the village. 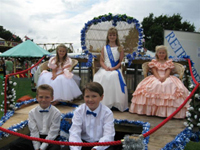 The Ashington Carnival Princess 2012 is Sarah Shaw age 10, and her two Attendants are Scarlet Marshall age 6 and Patience Sigston age 11. And the Pageboys are Sam Holden age 6, Lewis Thomas age 8 and Matthew Wieland age 5. The Judge was a member of staff from Fowlers Estate Agents who said it was not easy as there were so many children to choose from and they were all special.. 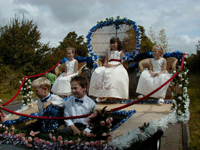 The Ashington Carnival Princess 2011 is Holly Neller age 10, and her two Attendants are Danielle Cork age 10 and Georgia Lund age 8. And the two Pageboys are Freddie Harvey age 5 and Nathan Baker age 8 all attend Ashington C of E School. The Judges were two members of staff from Fowlers Estate Agents who said it was not easy as there were so many children to choose from. 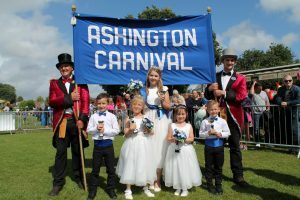 The Ashington Carnival Princess 2010 is Chloe Bull aged 11, and her two Attendants are Amy Burroughs aged 10 and India Manville, aged 9. The two Pageboys are Cavan Sopp aged 7 and James Newland, aged 5. All of them attend Ashington CofE Junior School or Rydon Community College. 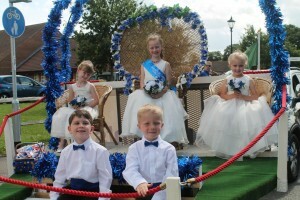 Ella-Louise Burtenshaw, age 6, was crowned Ashington Carnival Princess 2009 at a Children’s Party for the village on Sunday 14th June. Her attendants was Katie Harvey, age 6, (right) and Amy Welch, age 10, (left). The pageboys were Jack Boxall, age 4 (right) and George Ralph age 9 (left). All attend Ashington CE School. 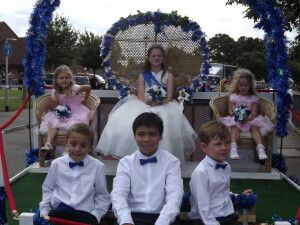 Daisy Kool age 10, her 2 Attendants were Lauren Irwin and Lydia Allam both 8 and the Pageboys were Matthew May age 9 and Alex Pegler age 6, all went to Ashington School. 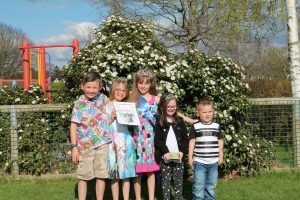 Cheyenne Derwin age 9, her 2 Attendants were Sarah Pearce age 9 and Amelia Hamlet age 6 and the 2 Pageboys were James Coomb-Humphreys age 6 and Matthew Ames age 5, all went to Ashington School.